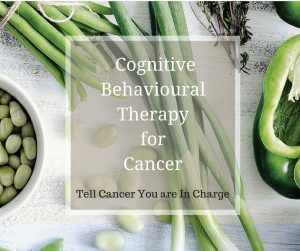 Many people on a cancer journey decide to make changes to their diet following their diagnosis to help support their ongoing health and wellbeing. This could be cutting out refined sugar, going wheat and gluten-free, eating more plant-based meals and cutting out dairy. 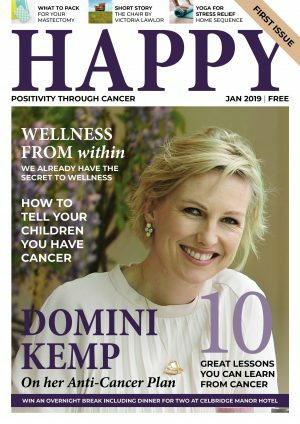 Today we are delighted to welcome a new contributor to Happy Magazine. 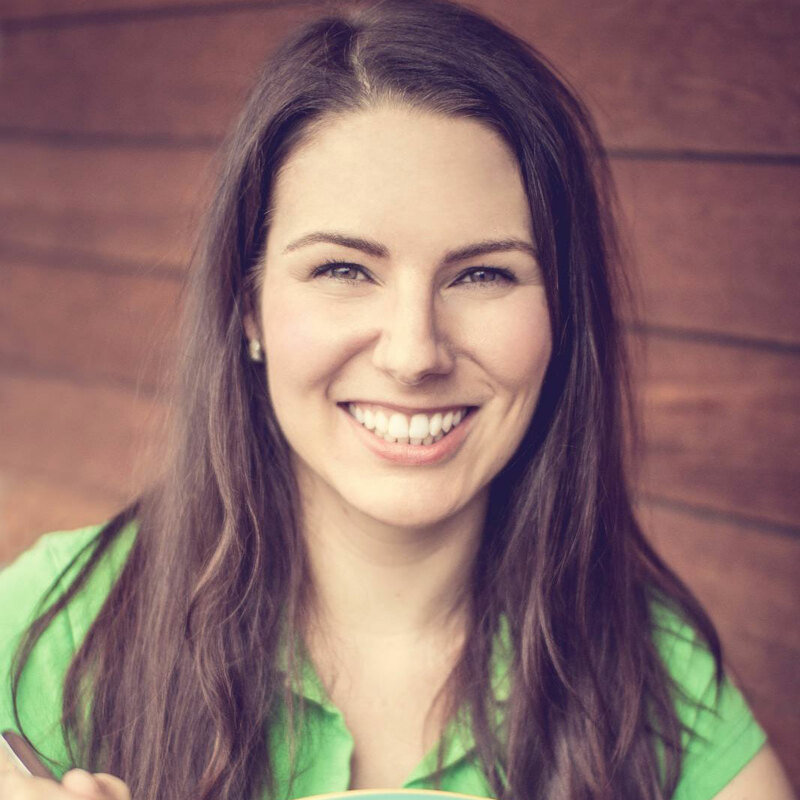 Eva from The Healthy Tart is going to be bringing you tasty, healthy recipes straight from her kitchen. 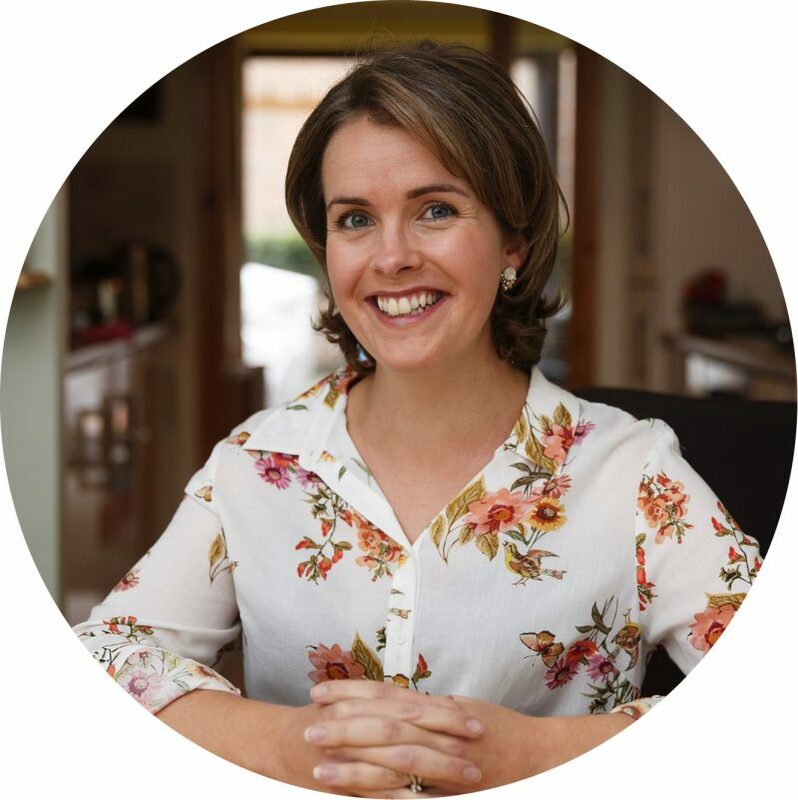 Eva has developed a wide range of recipes that cater to special dietary requirements, such as gluten-free, dairy-free, sugar-free, vegetarian and vegan and we are absolutely thrilled that she is going to share them with us here on Happy Magazine. 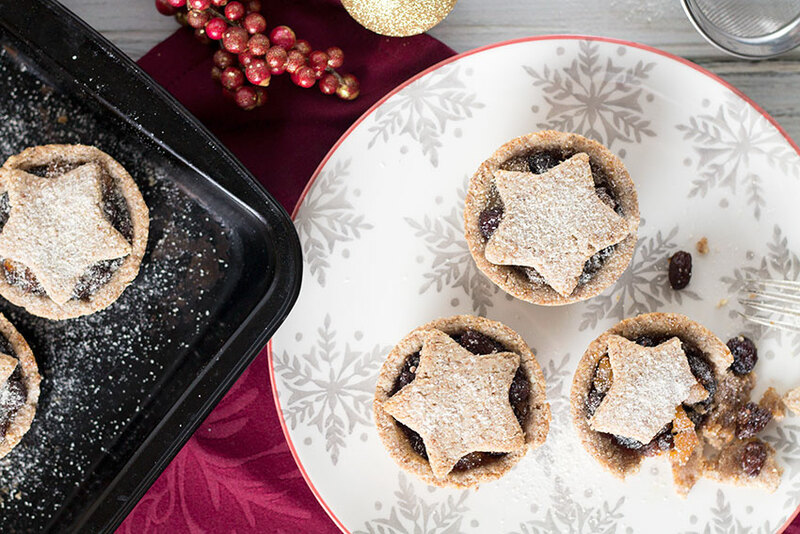 To start off, we’re bringing you Eva’s Healthy Vegan Mince Pie recipe – a perfect, healthy treat for these colder weeks in the run-up to Christmas. 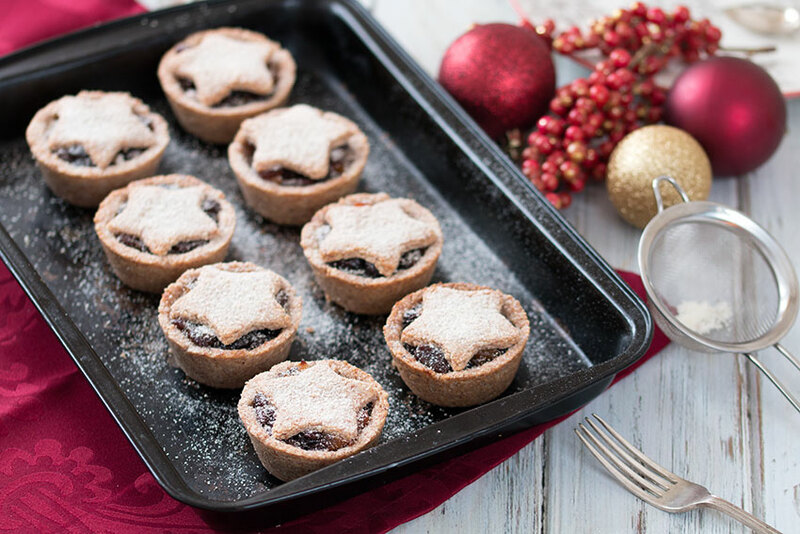 These Healthy Vegan Mince Pies are incredibly easy to make and a treat for the entire family. Best of all, they are super yummy and free from gluten, flour and refined sugar. The combination of fresh and dried fruits give it a lovely natural sweetness without being overpowering. Once they are in the oven they fill the kitchen with the most delicious smell of oranges and cinnamon. I love the pre-Christmas period and all the baking and smells that go hand-in-hand with it. It reminds me of my childhood when I used to make Christmas cookies with my mother and grandmother. I find that German Christmas tradition differs a lot from the Irish but of course, these traditions are very individual for every region or even family. Christmas in our house was always quiet and reflective which might also be the case because I am an only child. About a week before Christmas we would start baking multiple versions of “Spritsgebaeck”, “Kokosmakronen”, “Printen” and “Spekulatius” which wouldn’t be served until Christmas Eve. We always decorated the Christmas tree on the morning of the 24th which usually evoked discussions about the best shape, hight and kind of tree. In the evening we attended mass followed by a small dinner consisting of toast with scrambled eggs, prawns and a selection of smoked fish. To be honest, I have no idea how this came about and I don’t know of any other German families who would serve this on Christmas Eve but traditions are what you make them. Some families enjoy 3-course dinners serving goose with potatoes and apple red cabbage while others reserve that for Christmas day and prefer a humble potato salad with sausages. 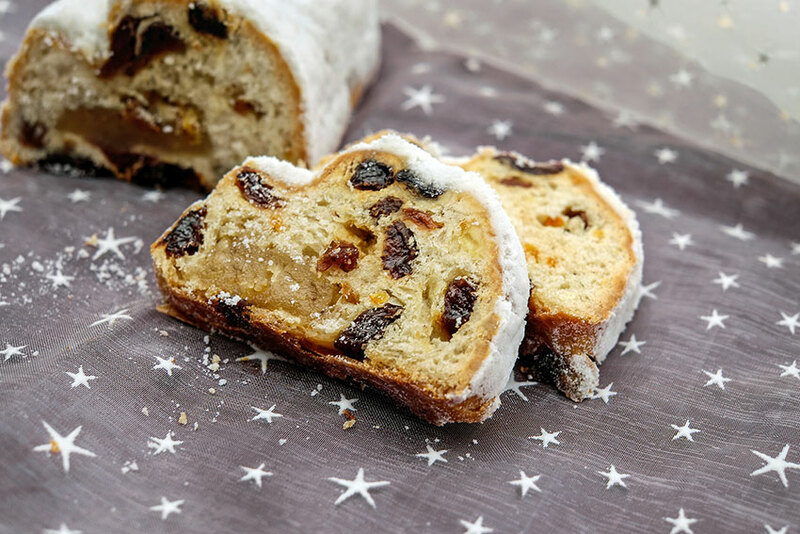 One of the most popular Christmas desserts is called “Christmas Stollen” it is a fruit bread containing dried fruit and often covered with powdered sugar or icing sugar. The bread is usually made with chopped candied fruit and/or dried fruit, nuts and spices and probably the closest we would have to mince pies. On my Magical Vegan Gingerbread Mousse Recipe, you can read about my first real Irish Christmas experience which I can only describe as baffling, to say the least. We didn’t have mince pies in Germany, not to mention healthy vegan mince pies, which made me quite excited about giving it a go. Well, at the beginning I didn’t understand the entire concept because I was actually convinced that they were made of minced beef, yes, even after living in Ireland for 5 years things get sometimes lost in translation. To my understanding, mincemeat is a very typical British and Irish thing which isn’t that readily available across the shops in the US. But we are here to make it from scratch anyway, aren’t we? My version doesn’t get run through a food processor to give it a more chutney-like texture but feel free to give it a quick blitz. Mincemeat usually consists of a mixture of finely chopped fresh and dried fruit which get’s simmered at a low temperature for about 30 minutes or until all the fruits have gone soft. You need to stir regularly to prevent it from sticking to the saucepan. The only liquids that get added are orange juice and a bit of vanilla essence, sounds fairly simple doesn’t it? What’s probably most important to point out is that this dough needs to rest in the refrigerator for about 30 minutes before you can roll it out. Otherwise, it will be too soft and you will struggle to lift it into the cupcake tins. 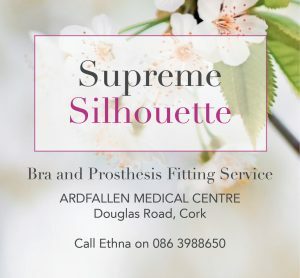 It might be slightly crumbly and crack around the edges but don’t worry you can simply fix this by pressing it with your fingers. Roll it out about 1/2 cm thick, cut out 2-3 circles at a time, re-shape the remaining dough into a ball and roll it out again until you run out of dough. Use pastry cutters or the rim of a glass to cut out the circles, they should be slightly bigger than the moulds of the cupcake tin. Carefully transfer the circles into the cupcake tin. Repeat the process with the second dough ball but use a star-shaped cookie cutter (or any other shape). 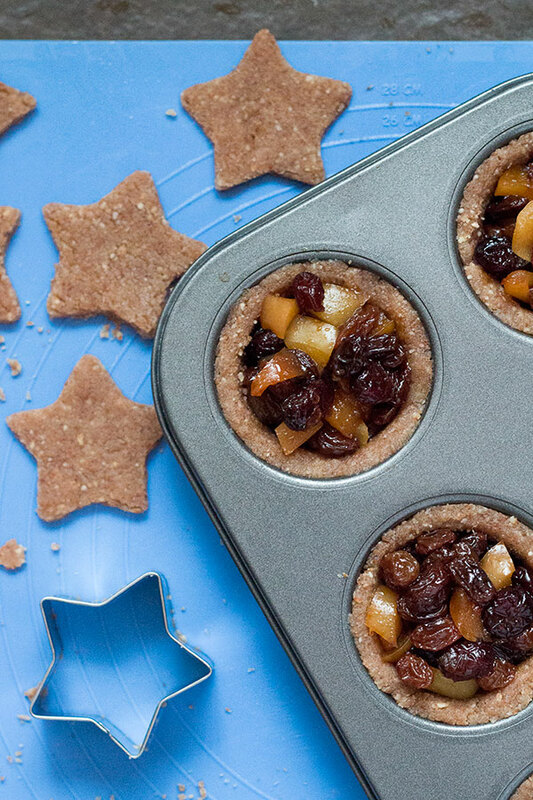 Now, fill about 1-2 tablespoons of vegan mincemeat into each form and cover it with a star. Bake for about 12 minutes at 180°C. As I wanted these Vegan Mince Pies to be healthy I disliked the idea of dusting them with icing sugar but then I realised that coconut flour looks almost identical and that even the flavours worked well together. Mr Healthy Tart who isn’t very much into healthy eating requested mince pies and I promised to make them but I didn’t tell him that I was going to put a healthier spin on them. Therefore I was quite anxious when I presented them to him. To my delight, he liked them a lot and kept munching away on them over the next couple of days. They keep for about a week if you store them in an airtight container in the refrigerator. 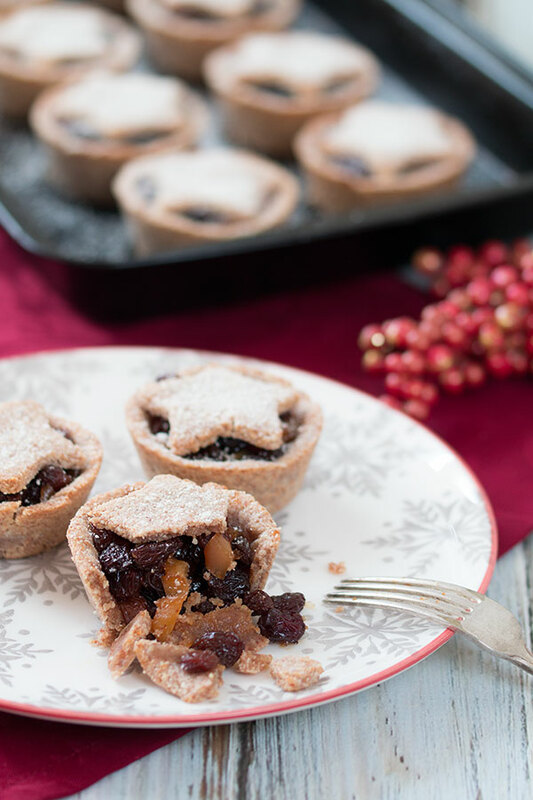 These Healthy Vegan Mince Pies are incredibly easy to make and a treat for the entire family. Best of all, they are super yummy and gluten-free. Start by making the crust because it needs to chill for about 30 minutes while you are preparing the mincemeat. Make a flaxseed egg by mixing the ground flaxseeds with water and stir until it turns into an egg-like texture. Add all the ingredients for the crust to your food processor and mix until it forms a crumbly dough. Split the dough into two even parts and shape it into balls, wrap each ball with cling film and refrigerate for about 30 minutes. Core the apples and chop them into small pieces. 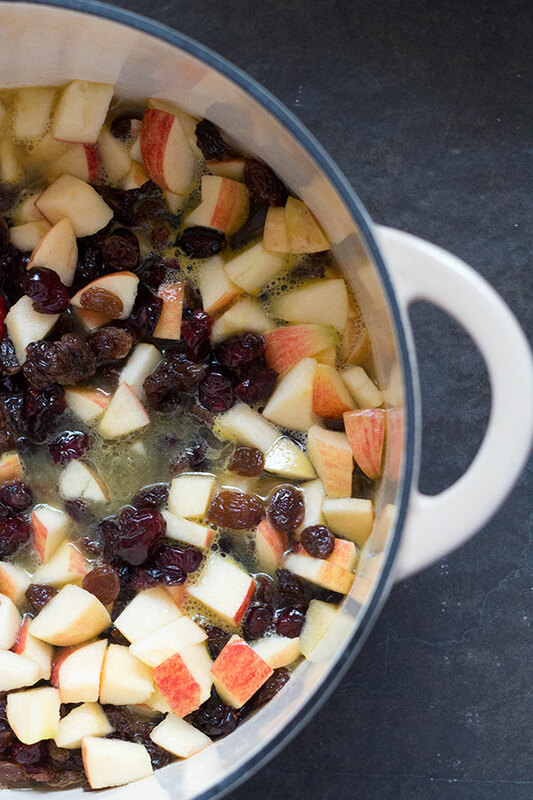 Add them with the other mincemeat ingredients to a large saucepan and simmer for 30 minutes or until the apples are nice and soft. Stir regularly and cover with a lid. Grease a cupcake tin with coconut oil. Remove one dough ball from the fridge and roll it out until it is about ½ centimetre thick. It might be a bit crumbly but don’t worry that’s normal, just keep pressing and rolling. Use a pastry cutter or glass to cut out 12 circles which are about 1 centimetre wider than your cupcake moulds. Carefully lift the dough circles into the cupcake tins. They might crack when you press them into the moulds but you can easily fix those with your fingers. Fill 1-2 tablespoons mincemeat into each mould. Remove the second dough ball from the refrigerator and roll it out until it is about ½ centimetre thick as well. Use a cookie cutter of any shape to cut out the lids, I used a star-shaped cookie cutter. 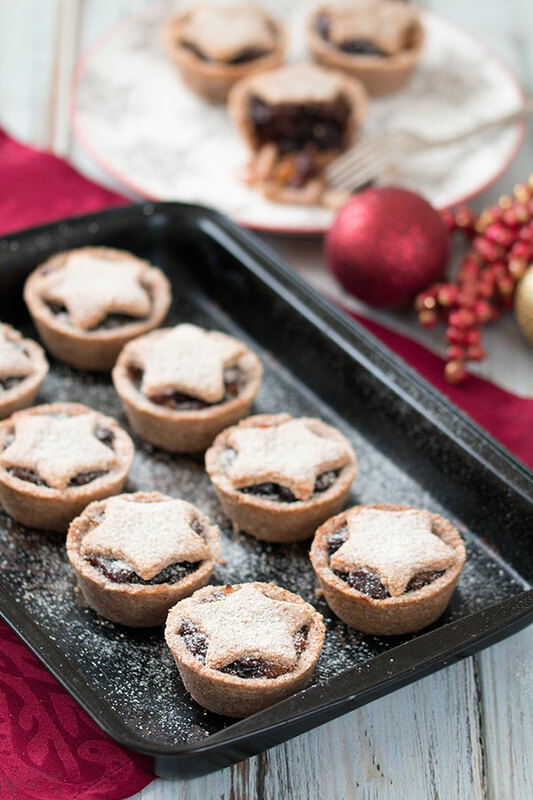 Place the stars on top of the mincemeat and bake at 180°C for about 12 minutes. Dust with coconut flour instead of icing sugar. They keep for about a week in an airtight container in the refrigerator. The post Healthy Vegan Mince Pies appeared first on The Healthy Tart. Re-published here with permission.